Plantain pith a killer of kidney stones. Has to be consumed at least weekly once. Bored of making kootu, poriyal and usili. Try this quick rasam you are going to love it. In a bowl take 2 cups water add tamarind paste, tomato puree, salt, asafoetida, rasam powder mix well and keep aside. In a pan heat oil add mustard seeds once it cracks, add cumin seeds, curry leaves and pour the rasam mix and let it cook in medium fire. Mean while boil plantain pith in 1 cup water and cook until they soften. Remove from water cool it and grind until smooth, strain it and add to boiling rasam. Garnish with coriander, finely chopped plantain pith and serve hot with rice. this is totally new to me.. though we do a varities of rasam i have neevr heard of this.. rasam = comfort :) n this sounds very interesting! This is a new recipe to me, never heard Platain Rasam, will try soon..
Omg, wat a healthy and inviting fingerlicking rasam..Love with rice and papads. Ahh.. 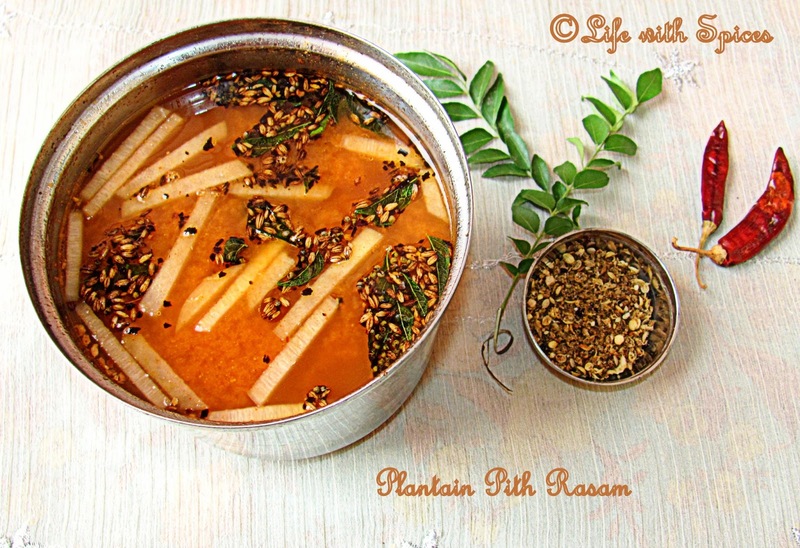 Healthy & tasty rasam.. Never knew that rasam cud b made with plantain pith !! Very innovative and healthy rasam.